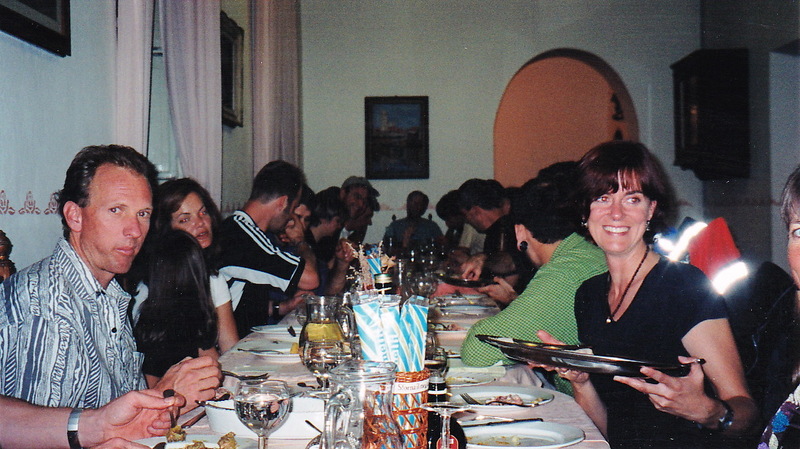 Shortly after arriving in Tropea Italy we were introduced to our neighbour Garth, from Australia. We went out for dinner to place he's often frequented for a nice first meal in Italy. While there the family who run the restaurant invites us to their house for a traditional new years eve dinner. Of course we accepted. This isn't the picture of the dinner as we thought it would be rather tasteless to take tourist photos. However, it is pretty similar. Maybe not quite as dated. We witnessed one of the great wonders of Italy. Neither the Leaning tower nor the Colosseum we witnessed. It was the Italians ability to devour food. From the moment we took our coats off at the door around 9pm we were seated at the table and ate non-stop until midnight. So many wonderful dishes cam out. Deep fried tuna ball things, which weren't greasy of heavy. Fried zucchini drizzled with yummy olive oil. Some sea food bread meatball thingy. I'm sure I missed some things. Of course red wine is flowing very freely the whole time. Next course is cuddle fish ink spagetti. Everyone's teeth were black, and it was quite yummy. Different, but yummy. The cuddle fish was caught by the grandfather not far from the local harbour. Each of these courses would be a full dinner for Ashley and I. The others around the table ate the same portion in the fraction of time I or Ashley did. Didn't even phase them as they looked forward to the next course. We had various strategies to cope with the onslaught of food. Ashley's was not take anything from the table, but to only eat what was placed on her plate. I would take a few things from the table and place them on my plate so it looked like I had more, thus avoiding more being added. Near the end we banded together. If one was served something new, we would divide it in half and give the other half. That way we would try everything, not be rude, and cut or portions in half. This seemed to work the best. So after the ink spaghetti there was home made lasagna. This was probably the best course. SO yummy. Not sure if it was the home made noodles, or the cheeses used or what. The sirens song of seconds all most took me. Next was cheese and other yummy stuff squid. Pretty sure I missed one or two dishes. It was really quite a blur. Desert started. Various patries started arriving at the table. Limoncello soaked pineapple and mellon. Chocolate covered cookie things next. A full bowl of ice-cream. And finally a volcano cake thing which base was the size of a large dinner plate and about a foot tall. I'll be short with drinks. Sprite and mineral water for non-alcohol. Various red, white, and sparkling wine. Near the end of the meal grappa came out. This is a made from distilling the skins and other leftovers of wine making. Basically moonshine since it's around 70-120 proof. Limoncello and other liquors were available. And of course as we neared new years the champaign started to flow. The room was filled with boisterous Italian conversation. Very much feeling like being apart of My Big Fat Greek Wedding, but in Italian. We were welcomed as one of the family and they made a special effort to include us as best they could. Very little english was spoken by the family save a few members. If your mouth didn't have food in it, you were laughing as the humor and glee transcended culture and language. You could just roll with it like floating down a river. Just go with it! Similar to the football game, every so often a loud bang would ring out from somewhere in the twon. Fireworks were also going off from various places in town. I watched by the window as sparkles filled the last of the 2011 sky. Of course would be interrupted by the odd flash and bang. By the end of the night we were driving back to our little town square. Completely filled with food and kindness by these local Italians. A grand end to 2011 and start of 2012. Buon Anno! !